Since then Pedro’s quest to find out more about his condition has even guided his subject choice for a PhD, for which he is focusing on the social aspects of LHON. This taught him that “each LHON patient, regardless of their degree of eyesight, learns to live with LHON and tailors their life to their needs”. He also concluded that in Spain, where people living with LHON might also turn to the National Organisation of the Spanish Blind (ONCE) or the Spanish Federation for Rare Diseases (FEDER), patient associations should combine their efforts to work together. Pedro García has spent a large part of his working life communicating with non-governmental organisations. He has worked in radio for over 5 years, presenting and directing programmes. He is a speaker, lecturer and expert in social communication and is involved in the management and strategy of social networks. He has participated in a number of national and international forums on the topics of human rights and people with disabilities. 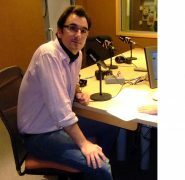 He has been working for the National Organisation of Spanish Blind People (ONCE) since 2016. To read further articles in this series please visit our Disease Spotlight: LHON channel produced by pharmaphorum in conjunction with Santhera Pharmaceuticals.